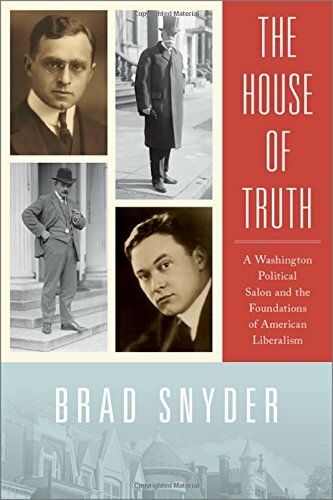 Brad Snyder’s new book The House of Truth is part intellectual history and part biography. Its focus is the group of American writers, lawyers, judges, artists, and politicians who between 1912 and 1932 sought to shape public opinion and use the law to advance progressive causes. The group included future Supreme Court Justices Felix Frankfurter and Louis Brandeis, writer and editor Herbert Croly, journalist Walter Lippmann, industrial counselor Robert Valentine, prosecutor Winfred Denison, and sculptor Gutzon Borglum. What they all had in common, at least initially, was a belief in government’s ability to solve or ameliorate social problems and the law’s promise of fairness and justice for all. They gravitated toward Washington, D.C., and progressive politicians like Theodore Roosevelt, Woodrow Wilson, and, later, Franklin Roosevelt. Snyder, a constitutional law professor at the University of Wisconsin, describes with impressive detail the personal relationships between these progressive elites, their advocacy of progressive causes, and their quest for influence and power during the First World War, the Harding-Coolidge-Hoover era, and the beginnings of the New Deal. Many of the progressive elites had a connection to Harvard University or Law School. Their preferred journal of opinion was The New Republic, which Croly founded and edited, and for which Lippmann and Frankfurter frequently wrote. Most progressives backed Wilson’s utopian goals in taking the U.S. into the Great War. They effectively took the reins of power with the advent of the New Deal. Snyder admires Lippmann until Lippmann becomes more conservative. He scolds Lippmann for “retreat[ing] into pessimism and detachment.” Snyder even praises Borglum, the sculptor of Mount Rushmore, for his monument to governmental power despite his association with the Ku Klux Klan. The author is at best ambivalent about Justice Holmes who never shared the full-fledged liberalism of the House of Truth. Snyder’s progressivism colors his history. His description of the Sacco-Vanzetti case accepts the Left’s view that the defendants did not receive a fair trial and were likely innocent. He downplays the fact that Justices Brandeis and Frankfurter stretched and breached ethical boundaries by advising presidents while serving on the Supreme Court, and lauds their efforts to “use the courts to advance their political and legal agenda.” Judges in our constitutional system are not supposed to have a political or legal agenda. He notes that progressives filled the ranks of the New Deal agencies, but fails to mention that many of those progressives, like Alger Hiss (who clerked for Justice Holmes) and Michael Strait (the post-World War II publisher of The New Republic), later became communists and served a foreign power. Finally, Snyder does Walter Lippmann a disservice simply because he abandoned the progressivism of Frankfurter during the 1920s and 1930s. Lippmann became one of the most astute critics of FDR and the New Deal, and later wrote brilliant books on foreign policy from a realist perspective. There is no sense here of the limits of governmental power or the danger posed by the growth of the state. The grave lessons of the 20th century are ignored. Francis P. Sempa's most recent book is Somewhere in France, Somewhere in Germany: A Combat Soldier's Journey through the Second World War. He he has also contributed to other books as well as written numerous articles and book reviews on foreign policy and historical topics for leading publications. Mr. Sempa is Assistant U.S. Attorney for the Middle District of Pennsylvania. The views reported in this review are those of the reviewer and not those of the U.S. government.